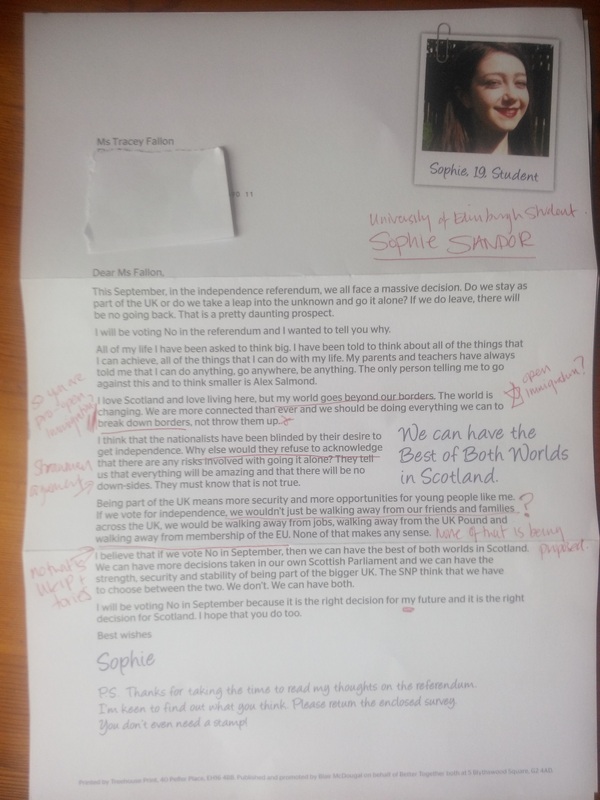 The Better Together lobby have a new campaign to “target 300,000 female swing voter all across Scotland” with a letter from a 19 year old Sophie Sandor who, according to their website, is a Edinburgh University student from Ayrshire. I was one of the lucky ladies to receive the letter yesterday and to be honest, I found it rather annoying. I am getting a bit tired of being told indirectly that we are a bit crap – that we cannot get by without the UK government and its vision. It suggests that independence for Scotland is a move to narrow, inward looking nationalism, while UK nationalism is global and progressive. I am perturbed but perhaps not surprised that a bright student at one of Scotland’s top universities buys into the echoes of colonial attitudes and ignores how UK nationalism is turning inward as UKIP wins the UK’s EU majority. So as Sophie writes that she is “keen to find out what I think” I decided to reply with my own letter and sent it in their freepaid envelope. Here is that letter and my reply. I encourage you to write one of your own too as the people that live in Scotland are not a bit crap, and we have a choice and do not need to be carried along with the political shift to the right where the UK government is leading us. I am not a member of Yes Scotland just a peeved off Scottish women with an opinion. Send your letter to: Better Together, Freepost RTAU-ZCRB-TELS, 5 Blythswood Square, Glasgow, G2 4AD. Freepost costs go to the campaign. so send your letters! I received your letter today and read it with interest. You write you are “keen to find out what I think”, so I thought I would write you a letter too. You write that supporting independence is “to think small” and goes against the ambitious possibilities your teachers and parents instilled in you. Yet, thinking big and having lofty ambitions is not related to how much territory belongs to a country. We can hardly look to nations like Finland, Sweden, Denmark and accuse them of thinking small. In recent weeks, the only political campaigners telling me that I cannot “do anything, go anywhere, be anything” is the pro-union campaigns. This month I went to the cinema and saw an ad called “separation”. In this, a young man tells a second man a joke about an Englishman, Scotsman and Welshman going abroad and losing their passports. The punch-line is that the Englishmen and Welshman get home but the Scotsman does not. This ad tells me that Scottish people lack the ability to govern themselves and help our citizens abroad, that we can only do things if we are helped by London. This sends a message that Scottish people are incapable of ruling themselves. However, I don’t agree with that. I believe that the Scottish people will be just as capable of running their own country’s institutions. We can also “do anything”. Your letter talks of risks, so we need to consider the risk in staying in the union. Will Westminster lead us to withdraw from the EU? Will we get involved in another war that we oppose? Will money be spent on nuclear weapons instead of education and health? Are we to see a further dismantling of the welfare state? As you will know, Scotland’s population is a minority compared to the rest of the UK. In the post-war era Scotland has never swung an election, only made it harder for the winning parties to have a majority. I would like to live in a democracy where the policies follow the political direction of its population in domestic and international affairs. The track record of the UK government in recent decades for Scotland on that front is not so good. You write that independence would reduce opportunities for young people. But it is rather limiting to believe that only London can provide them. So far, the Scottish Parliament’s powers have been able to safeguard opportunities for young people in the form of free university education, unlike students in the rest of the UK. Many disillusioned young people took part in the riots of London and Manchester in 2011. With little hope for jobs and education the future can look very bleak. I believe that a government that invests in the education of its young people provides more opportunities. You think independence would mean “walking away from” membership of the EU. However, an independent Scotland can negotiate a better deal for Scotland. Ireland, a country of roughly the same population size as Scotland has 11 seats while we have six. A good start for Scotland would be to negotiate more seats so we can have a greater say. If anything, risk and insecurity for Scotland’s future membership in the EU looks greater by staying in the Union. You will have seen that in the recent European elections, England has voted for a UKIP majority that wants to lead the UK out of EU. This increasing isolationist right-leaning British nationalism poses a greater security and stability threat to an outward looking cosmopolitan Scotland than independence. I have confidence in Scotland and the Scottish people’s abilities. However, your letter was full of keywords of fear and insecurity: “unknown, daunting, blinded”, and loss of “strength, security, stability”. Making the right decision in September is important, but it shouldn’t be one made out of fear and insecurity. I believe in our ability to govern ourselves. I want to live in a society that invests in education and health, makes defence and environmental decisions according to the local conditions, and is cosmopolitan in its outlook. We need more than insecurity and nay saying if we want a positive future for Scotland. One year ago I was one of the “swing voters” your letter speaks to. I have never been a member of any political party and have no party allegiance. However, the framing of the debate by the Better Together Campaign into polarised positions of bad, narrow, backward Scottish nationalism and good, progressive and worldly British nationalism is one reason why I now support independence. How we think about our nation and national belonging is important to the debate: I refuse to think of Scotland and its residents as incapable, I reject the ordering of EU migrants into good and bad to determine if they can belong and I support politics that thinks of the most vulnerable in society while investing in the youth for our national future. That is why in September I will vote for independence and I hope, for your future too, you will re-consider your own position. That is a brilliant response. Has ‘Sophie’ written back yet? Well said Tracy, and well done! Looks like it. Her twitter account tells all. Active member of Better Together, No Thanks and the Tory party. Nothing wrong with that but perhaps she could have mentioned that in her letter. Shades of another stunt BT pulled recently. Tut tut! Tracy’s letter, for me, contains aspiration and imagination. If only they could teach that at university. You shouldn’t be surprised that Sophie goes to the University of Edinburgh, where undoubtedly she’ll be subjected to group – think, as a young adult. Now how might that thinking go ? I’ll give you a clue. Although anecdote is my main reason for responding to your piece ( excellent letter, by the way ) if you peruse the recent figures for the sources of students to the likes of Edinburgh or St Andrews you’ll see a high proportion is privately educated, many out with the borders of Scotland. My daughter was raised in Kent and to my pleasure chose the University of Edinburgh ( it’s almost as good as attending the U of Aberdeen ! ) and I duly delivered her to Pollock Halls. I should have smelled a rat when some weeks later over the ‘phone she postulated that I hadn’t given her and her sisters the best chance in life – she attended a local CofE comprehensive and I think I was the only medical consultant in our town who “allowed” this. After meeting some of her new found friends ( I think she was the only one in her hall who hadn’t been privately educated ) I understand why she said it but it still hurt. These new friends had grown up in the school of hard knocks – boarding school can be like that with some worrying practices – and few if any remain good friends. Do not interpret this to mean that there aren’t lots of nice privately educated girls. The graduation duly came in the Usher Hall, and a Honorary Graduand was one J Naughtie and I think in his honour the choir did a superb rendition of ” Gin I were where Gaudie rins ” ‘cos Jim comes not that far from the Back o’ Benachie. Private schools do wonderful choirs – a godson of mine went to Radley and they sang beautifully when the Bishop of Oxford “did” all the boys before they moved on. Anyway Edinburgh’s Chancellor mentioned after the Gaudie song that it was appropriate since, after all, it was a Scottish university ! No doubt how he’ll be voting then. That then is the world Sophie inhabits. I write as the mother of a Scottish born and bred but English educated bunch, some of whom are at aforementioned illustrious Scottish universities, no doubt branded as English public school having had their Scottish accents ‘educated’ away.They went to English schools because Mike Russell’s team don’t provide Greek or Latin in Scottish state schools….Gaudeamus Igitur bring it on. HI Fiona, It’s very interesting that you say you chose to educate your children in English private schools because Latin and Greek are not on the curriculum in this country. I am not certain, but I think that some private schools in Scotland offer Latin and perhaps Greek. I know that St Aloysius Roman Catholic private school in Glasgow does. So you could have sent them there? I have to admit, I find it odd that the absence of Latin and Greek would have been the one reason you sent your lads down south to England. There were no other reasons? My grandparents chose to educate my mother and her two sisters at a private school for their high schooling. It was a Catholic school for girls near Perth. They had spent their early childhood in England, London in fact, because my grandparents had to move there for my grandfather’s work after the war. So despite spending 5/6ths of her life in Scotland, my mother – nearly retired – still has the thickest English RP posh London/Home Counties type “plummy” accent and if routinely mistaken for somebody who has just moved to Scotland from England. In many ways, she is very culturally English too so I can understand why. My other grandmother was sent away from Tayside to Edinburgh to attend a well known private school for girls by my great grandparents. Myself and my brother were state educated. Despite my mother and my grandmother having had some private education, I personally really hope for a society where folk don’t feel the need to educate their children in private schools, away from the majority of other children. I believe they are a negative phenomenon although I respect every individual’s choice about how they want their children to be educated and with who they want them to be educated. Incidentally, the most successful person in my family was my grandfather and he came from relatively poor (although most were poor when he was born) aspirational working class background and succeeded because of his intellect, hard work, and old fashioned values. He stayed on at high school until 17 because he was very intelligent although his family could not afford any uni or college or other education and he went straight into work. I am surprised that he allowed my mother and her sisters to receive a private education although I suspect my grandmother insisted on sending them to a Catholic school as she was a devout Catholic. Adam Ramsay has written a very though provoking article on private schools in Scotland you might want to read. He confirms to me what I have thought most of my life viz. that we should aim, like some of the Scandanavian nations, for a society where private schools are attended next to nobody. Was private school the only option for you then Fiona? I was educated in a local school in Midlothian and I took Latin. I also have an honours degree and a masters degree – though probably not from what you’d consider acceptable institutions being newer universities. As a qualified librarian I’ve worked with varying different students – tended to be the older institutions where the students felt I worked for them rather than was there to support them – perhaps that’s what they’re learning at private school? Sophie doesn’t exist. The Bitter Together mob would never directly place a specific individual in the critical firing line like that. That would just be irresponsible and reckless…oh, wait a minute. Yes, it looks like Sophie is on the Scottish Conservative committee at Edinburgh University. I, too, agree with Tracey that wanting to become independent means that we have the faith and courage in our own people to reach higher and go further. It seems that many want to stay part of the UK mainly because of fear of the unknown as Sophie mentions which is a completely unhelpful reason to vote ‘No’. In fact, as Tracey writes, there are no guarantees of a ‘safe’ life by staying within the union. Who wants a ‘safe’ life anyway compared to having our own voice in our own nation? I find it unutterably sad that there are Scots who think that we cannot rule ourselves, that we somehow need English public schoolboys to decide what is good for us. Especially since they have no interest or concern for our welfare, but a very personal vested interest in increasing the gap between the rich and the poor. Your comments are well made, although you only allude to the expensive obscenity that is Trident, surely the single biggest difference between the mind sets of our elected representatives at Westminster and ourselves. and Coulport nuclear store..brrrrrrr any young person should find this the one good reason for getting out before its too late, if its not already. “the world goes beyond our borders” Sophie opines; a world that Scotland as a country may look at but into which she is not permitted to venture…..without a big beefy proprietorial minder with a serious attitude problem. Is she a composite character created from a political profile study? Is she like many of the “characters” in the sister organisation,VNB, skilled in a brass musical instrument?. ‘Sophies World’, by Jostein Gardner is a fantastic book, should be curriculum text. The book is intelligent and life affirming, unlike the fake Sophie at bt, who has no mind, no brains, no substance. We can all see through shallow, we are not fools. She exists. Her FB page lists her employment as being a youth rep for Better Together. I got one of those letters and I have to say I was not at all pleased. I did think of replying but instead I just tore it up but your response makes me feel I should do the same. Now I know I was specially targeted to receive this junk mail I am even more mad. I don’t swing. Never have. I know exactly what I think on this issue and how I will vote. I’ll be voting yes and all my friends and family know this. You’re reply really annoyed me – so I will reply. Firstly – I did not detect any British Nationalism in Sophie’s letter. We face a question in September – do we want Nationalism (Yes) or not (No). The referendum is not about Britain, it is not about British Nationalism, it is about Scotland and do we want Nationalism or not. Sophie’s letter talks about breaking down borders – of course she does not want a border built between Scotland and rUK, but she wants to break down other borders as well. You want to turn this whole debate into Scottish Nationalism vs British Nationalism – which is the most or least nasty. I can inform you that that strategy is doomed to failure because a huge number of Scots do not want any Nationalism – and the only question we are being asked in September is do we want Scottish Nationalism or not. Which ever way we vote, we will be confronted by Nationalism again – possibly in an EU referendum – and we’ll have to put our shoulders to the wheel to defeat it again, and probably again. Some of your other comments are bizarre – where did the bit about Colonialism come from – hello this is 2014! The British Empire is long gone – not that you’d know by reading Scottish Nationalist Blogs. I’m amused at your linking of Sophie’s letter to “much territory belongs to a country” – then make comparisons with Finland, Sweden, Denmark – all of which are larger territories than the UK – what did you say about Sophie’s intelligence? You seem obsessed with being ruled – I suppose this is the feudal ambition of Nationalism. Governments are there to give us freedom – not to rule us – and the UK gives us more freedom than any Nationalism ever could. You want to talk about the risk of the UK leaving the EU – ok – what presents the biggest risk to Scotland – staying in the UK and leaving the EU – or staying in the EU and the EU’s border running from Gretna to Berwick? I’d say the latter is far greater risk. At least if we stay in the UK we’ll have the chance to fight British Nationalism – if we walk away from the table we’ll surrender our influence over our future. You seem obsessed with our population being in a minority – well the population of Fife is in a minority in Scotland, the population of Yorkshire is in a minority in England. You need to stop dividing people and start looking at what we have in common. Why the obsession with swinging elections? Why is it so essential? Note that we swung the current government from Tory to Coalition! So you need to check your facts a bit more. I’m ashamed that Scotland is the most Nationalist (UKIP + SNP), (and therefore least cosmopolitan?) country in Europe – we need to make it our mission to defeat Nationalism and stand beside anybody in the world who is oppressed by it. Hi Andrew; I don’t understand why you think that the whole issue on the 18th September is a toss-up between Scottish Nationalism or British Nationalism. Surely it is much more nuanced and deeper than that. What is wrong with wanting your own nation to be able to stand on its own two feet and believe it has the resources and people to do that? Speaking for myself, I currently live in Uganda doing development work, have an English wife and a Jamaican grandad. I am proudly Scottish, but not in a way to exclude others and oppress, but in a way to empower ourselves to be all that we can be to be a force for good in the world. Governments are there to give us freedom-not to rule us-and the UK gives us more freedom than any nationalism ever could……. The utter folly of the purblind unionist. The UK gives us more freedom than any self-determination ever could, does it? Such as the “freedom” to have governments we haven’t voted for. A government imposing policies that destroy people’s lives and condemn many of our children to grow up in poverty is a “freedom” I will be glad to see the back of, thank you very much. This is the second time the Conservatives have been in power in my adult life, and this time their policies are even more exploitative, divisive and scorched-earth than the last time. Andrew I don’t know what world you live in because you have got it totally wrong. Scottish Independence is about self-governance and the ability to transform our society into a fairer, happier country for all our citizens to live in no matter where they were born or what their background is. It is about the people of this land having control to change their own lives for the better. Many of those people who would like to at least have the ability to try and achieve this are not even Scottish(many are in fact English) and we are all pulling together on this. We feel we are a nation already but we can’t function as a true nation because most of the decisions are taken in London. We don’t want to be separate either because we want to remain very close friends with the rest of the UK, Ireland and Europe as well as increase our ties with the Nordic countries and the rest of the world for that matter. Surely it isn’t a crime to wish for the chance to govern ourselves and try and make our society a fairer, happier one? I find your comments exceptionally annoying Andrew. I can find few , if any, of the mealy minded interpretations you put on Tracey’s letter. You make wild accusations – for example – that Scotland is the most Nationalist country in Europe where your view is no more than opinion masquerading as fact. Where is your evidence ? How is Scotland the “least cosmopolitan” ? This is simply your own raw prejudice. Your shame seems ersatz, insincere, and expressed merely for point scoring. Sophie makes the point that being “part of the UK means more security and more opportunities for young people like me” and that we would be “just walking away from our friends and families across the UK” as well as the £ and the EU. These are simply parroted opinons of the worst elements of Project Fear. No wonder Tracey wanted to address them. For me and many others it is the UK which means insecurity and far fewer opportunities than a Scotland with a different role model than US corporatism – unlike the main three parties at Westminster. There are several currency options apart from a formal sterling link and economists whose opinion I do respect,such as Steve Keen, are fearful of a Scotland tied to a poorly performing and unstable currency like sterling with so many structural weaknesses in the economy – so maybe we would be better off out of it. None of my friends and family down south are remotely bothered by an independent Scotland. In fact, most wish they had the same opportunity we are able to seize. An informed view on the EU might even think the Norwegians have got it right – the EU is too right wing, too tied to big business, undemocratic and with a poor record on the environment – especially marine conservation, something where we have immense yet poorly managed resources due to the CFP. Read Ian McWhirter’s piece in Thursday’s Herald for a nuanced view. However, we will be in the EU whatever the referendum’s outcome and we will be part of a wider Europe. We will even have another 6 MEPs if independent and be better able to contribute to European reforms. Certainly there are no guarantees of any future European Union under the narrow chauvinism inspired by the rise of UKIP. That is a very high risk strategy for us all. Your fundamental premise that this is only about a perceived ‘nasty’ narrow Scottish nationalism is hopelessly wide of the mark. Thankfully, I know very few YES supporters with Cybernat views and very many who simply want self determination, the ability to make our own decisions, to create our own opportunities, and a Scotland which is not absolutely tied to a narrow form of neoliberalism. (for which read illiberalism). We want a country in our own image, not as 10% (ish) of a much larger entity where we have little influence given the primacy of London and the South East. This is not nationalism at all. As you will surely know the referendum cannot be won by a minority of Scottish nationalists and that the YES campaign is far wider and encompasses, Labour, Greens and many who are non-party political. Your posturing would pretty much define you as a Cyberbrit – and evidently there is little you would have in common with Tracey’s views anyway, hence your small minded attack on her. i am happy to be a scottish nationalist, cosmopolitan and internationalist. i see no need to apologise for scottish nationalism. andrew skea’s scotland-shire is a snivelling wimpish beast and he is welcome to it. It is a common thread that runs through Andrew Skea’s comments, viz. “It’s all about Scottish Nationalism,” and this despite having been advised several times in the past to study the difference between “nationalism” & “Nationalism.” He obviously hasn’t done so, as he keeps repeating the same old nonsense over & over. andrew skea has only one tedious furrow to plough, nationalism, especially our very benign variety, is evil. the british state, the uk perversely is good. he fails to see that NATIONALISM (the supposed uniqueness of the insular anglo-saxon model) has been the driver of unionist myth for centuries. it is narrated by the likes of david starkey and neil ferguson, particularly the latter who might have written the script for better together’s shpiel. scots, rather more than our co-partners, are suckers for this tale. i cannot figure why seeing that fundamentally the union was the english imperialist model in vitro. an experiment prior to its being let loose on the wider world. the divide and rule tactics learned in scotland, and of course in ireland, served well in acquiring the rich prize of india. those tactics are back home again. fortunately we have now developed antibodies. My assertion that Scotland is more Nationalist than any other country in Europe is based on the recent Euro election results, UKIP + SNP gained about 45% of the vote – more votes for Nationalist parties than any other country. I did put a question mark after my Cosmopolitan comment since this is less easy to measure but it was Tracey who seemed to suggest that this is inverse to Nationalism. Regarding currency – Yes would be much more honest if they discussed the options more openly – but this is a topic they are scared to ask and scared to answer (hence they call it scaremongering) because they know that indy introduces massive currency uncertainty, and that people generally want to vote for certainty. I agree (or at least i hope) that we would be in the EU after indy. However again Yes are scared to ask or answer the real question (they like to shout Scaremongering – LaLaLa). The real question is – on what terms will we get membership – i.e. schengen, euro, vat on food, rebate, etc. I was in Brussels a week ago representing my sector – it was brought to my attention that Kosovo currently can’t get membership because not all Eu members recognise Kosovo’s independence. There are more than just Spain who are worried about breakaway regions – Greece, Romania, Cyprus being a few others. There is also the problem that the recent members have all had to accept ‘standard’ terms so will they want to allow exceptions for Scotland. Some of the more established members might also want to reign in some of our opt outs and this is a good opportunity for them. I don’t know the exact definition of a CyberNat or CyberBrit – but i would have thought that a tendency to abuse would be one attribute. Sophie’s letter contained no abuse, Tracey’s reply question’s Sophie’s intelligence, I tried not to abuse anyone, but my post has received a fair bit of abuse and very little critical analysis. I am amazed at the blind worship Tracey’s reply has received despite it major inaccuracies (was it really quality enough to publish on BellaCaledonia). Yes Andrew it was only an assertion !. Some very dodgy interpretations of nationalism/ Nationalism there. The UKIP / SNP link is absurd and designed to paint both as extremists whereas only one of them is. If you use dodgy definitions and try to manipulate these to score negative points then you will tend to set yourself up. The present debate on currency options is both wideranging as a lot of us feel that Sterling is highly unstable with the easy transfer of ‘hot money’ out of London which would cripple the UK balance of payments (and it already has a distinct and heavy limp). Outsourcing of manufacturing has been a real failure but then most of neoliberalism is fantasy economics. I’m with Steve Keen on this (Try Debunking Economics for the full arguments). The different options for currency are well known so the ostrich tendency you claim is simply a myth of your own making. Of course there is Plan A, B C and D and that has been acknowledged by the SNP leadership. Political posturing continues yes, but the discussion has been open. On EU membership it suits the NO campaign to raise as many Aunt Sally’s as they can. Project Fear again. To compare Kosovo with Scotland is a chalk and cheese comparison and merits no discussion. I’m not happy with the EU at all simply because it is undemocratic and following the orthodoxy of the World Bank and big business but will go along with it as proposed Scottish foreign policy is predicated on internationalism (but without the militarism I hope). As we are entering a phase where we do need to discuss supranationalism we are better doing this from the inside – which is where we shall be, by common consent. Pretending otherwise is simply a glass 90% empty posture. Regrettably, your own use of language in your attack on Tracey would firmly place you somewhere on the CyberBrit spectrum, by your own definition. I’m sure she’ll survive. Politics is a rough business and Sophie, as a Scottish Conservative is destined for intense study at the school of hard knocks. Were you comparing like with like one might concede scotland had voted heftily nat, but we are not dealing with the same entity. the naughty unionist canard you repeat is to be taken at its “black propaganda”, pro-unionist face value. the back story of the faragists reveals a mix of home counties little englanders, nostalgic thatcher groupies, bnp/nf/edl types as well as non-aligned racists and bigots and a miscellany of the conventionally disenchanted. we have zilch in common with that. admittedly we desire the return of our national sovereignty as do the faragists. what we do with it is poles apart from their nostalgic, europhobic back to the fifties universe. btw. scotland is not a kosova or an albania or a breakaway “region” however much some might condescendingly care to think. our case is complex. this is no easy “tick the box” exercise as appropriate boxes are generally not provided by the “examiners” who in any case have their particular subjective criteria…..so we create our own. The Scottish cringe seems as strong in you as it is in Sophie. A nice attempt at misdirection (again!). Don’t let it be about wide ranging, open potential – keep it political red versus blue / left versus right. Pick a side and don’t think! People of all walks of life and political opinion are excited about the thought of building something different. A discussion that opens options instead of closing them down with negative bluster to protect the elite. My country and it’s potential are far more important than any political party. I want to explore those options. I’m not angry with Sophie (if she exists). I’m angry at the people who manipulated her in order to influence the outcome of a vote and destroy an opportunity. I don’t want to ignore foodbanks / The gap between rich and poor / de-industrialisation / privitisation of health / high cost education proposals/ Wars and WMD / The UK drifting ever further right /etc. These are current facts. Instead of an angry reply about Borders / EU / Pound….pause for just a moment. What kind of country would you like to live in even if the UK remains together?. What are the chances of that world becoming a reality if the UK stays together?. Am I a dreamer? – I hope so. I would hate to think that this is as good as we can achieve in the 21st. Century. I don’t want to hear about party manifestos – I want to hear people! All of the people RIC / Reid Foundation / Scottish Democratic Alliance and every other grouping. I want the political parties to listen to the views of the people people and develop their policies. I then want Scotland to elect a party or parties which they chose. Clootie, nice reply! I’m also a dreamer! I want a better nation. Like you say, it is about people, not about ‘them’ and ‘us’ and all that. I’ve always asked people what is their vision for Scotland? I also feel that a vision for a better Scotland can be best achieved with independence, but even if the UK stays together as you say, we all need a vision for a better nation! May I be a dreamer too, please ? Speaking of Alliance, I am thinking of another type, namely Alliance Trust based in Dundee. This is another Scottish financial outfit with a proven track record – over 125 years of provident use of our money. In anticipation, I have repatriated all my savings so that they will be in a new financially secure country. Tracey here. I’m glad you are engaged in the discussion. To clarify, I am using the term nationalism here in a broad sense: of thinking about the nation, nationhood and questions of political autonomy. What Sophie’s letter does is portray UK nationalism as progressive and worldly (here UK nationalism means a Scottish nation joined with the other nations of Wales, England and Northern Ireland within the sovereign state of the UK). What I do in my reply is to question that particular image of the UK nation by contextualizing it within the recent EU parliamentary results that shows a very different image of the UK. Nationalism is as scholar Elie Kedourie said “very much a matter of one’s self view, of one’s estimation of oneself and one’s place in the world”. Nationalism isn’t only about what the racists and those with anti-foreign sentiments do. When we are discussing what we want for Scotland or the UK we are engaging with ideas about nationalism. Now, how you are using nationalism is referring to that idea of a narrow, xenophobic, parochial nationalism; of a people that views itself as superior to others. I think we probably share a great deal in our dislike for this kind of nationalism. And this is something that Scotland, like all nations, should remain alert and self-reflexive about. Whenever there is a discussion of who “WE” are as a nation, is creates exclusions. For example, those exclusions may be based on where people come from. However, I believe we need to have a flexible and open attitude to national belonging. So whether people are from Bulgaria or Bolton, the national community should be able to accommodate all those who live in it. i am surprised to see Kedourie quoted in your reply. he had an idiosyncratic take on nationalism, the arab varieties in particular. being from a diaspora iraqi jewish background he did have a particular trenchant ax to grind. He regarded imperialism, whether ottoman, american, french or british as basically good. the influence of european “values” did liberate jews and christians from the second class status the old system imposed but brought the idea of nation as well which he considered alien poison to the culture. He decried the complacency or lack of will in the imperial systems as responsible for the mess the arab world in particular was in. the french should have stayed in algeria etc. the brits in india and egypt, and the americans in iraq, at least until the job, whatever that entailed, was done. He failed to see the double standards of the british et al in exploiting “the arabs” for their own ends: oil for wars, free passage to india thanks to control of suez and puppet gulf regimes or simply naked expansionism. He was an intellectual conservative who disliked the intrusion of modern academic disciplines into the “pure” field of history. He would not be on our side. better together would have loved his assessment of our case…..go to it UK? I think you need to stop worrying about which state is sovereign and which is not. Technically the UK might be our sovereign state – but in practice Holyrood has sovereignty over most day to day issues in our lives, Westminster has sovereignty over others, and Brussels has sovereignty over many. Proof is that the UK cannot not get control over some EU issues without renegotiation, and likewise WM could not take control of things from HR without negotiation and agreement. What we need to do in future is review which issues are controlled by each level of government and make changes one way or the other as appropriate – we want to do this based on logic (argument/ debate/ referendum if appropriate). The world we live in is very different from 100 years ago, very very different from 300 years ago, and different from 50 years in the future. What is appropriate for any period may not be appropriate for another. We could argue about the past, but the past is fixed so can’t be changed (e.g. bringing the British empire into the debate is completely pointless). Devolution is appropriate and successful for Scotland. Now that it is bedded in, further devolution is now appropriate (as has already been agreed, and more). It may be that with hindsight it is agreed than certain devolved issued would be better centralised. I think that all matters of government should be dealt with by the most appropriate level of government – without the need for any person to have a single Nationalist identity. I’m happy for people to have an identity / culture based on their nation but this should have only very limited connection with their government – thus allowing people of many different identities, mixed identities, and no national identity to live happily in any nation with any government. What i really object to in this indyref debate is the dogmatic belief that we are different from the people of rUK, and that we need to run every aspect of our government irrespective of the logic for where sovereignty lies – this is my definition of Nationalism. My further worry about nationalism is that it is very difficult to divide good nationalism from bad nationalism – and cuddly nationalism tends to want to make nationalism acceptable, but in fact tends to make all nationalism a bit more acceptable, and so it grows and people find it increasingly difficult to tell the difference. To my dismay, Nationalism seems ingrained in many Scots – by contrast the people of London rejected Nationalism at the EU elections. I would be very proud if Scotland would rise above nationalism. If we could remove nationalism from our politics then we might find it much easier to reach consensus on which areas of government should be devolved – because we would stop alienating one section or another of society. It is my dream that nationalism is defeated in our referendum and that we can proceed to discuss issues without the constant claims that one nationalism is better than another nationalism. The vast majority of Scots believe that the UK is currently the logical sovereignty for our currency – i therefore believe that this should be managed by a government that we democratically elect (i.e. send MPs to represent us). I also believe that to tackle the threats to our interest in the world, Defence is also better done together. I also think we need more integration in corporate regulation and taxation rather than more fragmentation – we need to tackle tax evasion by global companies. As a business man, i see little benefit in fragmentation of VAT in the Uk – business prefers level playing fields (unless it’s objective is to avoid tax), and a see no benefit in making it necessary for people to travel specifically to shop and save tax. There are many other areas of government where I have less insight that i believe are better done together – e.g. pensions, financial regulation, etc. At the same time, it think it is unhealthy for the Scottish Government to be responsible for spending tax, but not raising it – however a simple answer to this problem might not be easy to find. We could for example transfer all control of Income tax to Scotland, but what happens if Scotland has a period of very good or very bad economy and has too much or not enough tax? More importantly, what if some devolved part of the UK is seriously short of income tax for a prolonged period – resulting in further economic decline? The whole benefit of sharing in good times and bad should not be forgotten – if WM gives away sovereignty over income tax then we find it leads to greater inequality then it might lead to greater resentment and greater nationalism. A balance needs to be found – but we’ll not find that balance so long as our politics are driven by nationalism. DIVERSE RANGE OF CULTURES HERE, UNLIKE ENGLAND WHERE THE PEOPLE VOTED IN MASSIVE NUMBERS FOR UKIP,AND LIKE NIGEL WANT EU CITIZENS THROWN OUT AND NO NORE ALLOWED IN, YOU STATE YOU WILL STAND ANYONE IN THE WORLD WHO ARE OPPRESSED BY IT. SCOTLAND HAS BEEN OPPRESSED BY THE UNION FOR YEARS, WE ARE MORE THAN CAPABLE OF PAYING OUR WAY IN THE WORLD AND WESTMINSTERS DEBTS. Andrew you are a Troll (not a very good one either !) And your poor attempt to misdirect intelligent folk to your way of thinking just winds everyone up. You are not convincing anyone so may we suggest you go take Sophie with you for a right hike and close your mouth before you vomit any more egg water ! Magnificent Tracey. Let’s hope Sophie reads it. HI tracey, I was worried about Sophie and wrote to her too, I wrote Dear Sophie, I read your letter with interest, I think if you truly believe you re better of, you should pay the student fees you currently save approx. £9000.00 per year , as a gesture of goodwill, to your place of education. You must learn, and I know you re young, to apply the same principals as the politicians your listening to and think only of yourself and monetary gain. Only the Scottish Government with a majority of SNP members will offer you FREE education, then the world will be your oyster with no huge debts to burden your young mind.Sophie please think again about your future. Finland and Denmark bigger than the UK? That’ll come as a surprise to the five million Finns and the five million Danes. I suppose if they were sensible they’d hand their sovereignty over to Russia and Germany. No borders, you know what I mean? Andrew is referring to area, not population I guess. Finland is actually larger than the UK, although to say Denmark is bigger you’d have to include Greenland, which is more-or-less independent from Denmark. Wooly thinking which IMO is revealing of his mindset. You could only describe Denmark as bigger than the UK if you were of an imperialist frame of mind, drooling over maps with ‘your’ bits coloured in pink. Sad. LOL. So you can’t bring yourself to admit that I’m factually correct (though i accept that i needed to bring Greenland into the equation to give Tracey a score of zero out of three) while while Tracey who was the one to bring the topic of ‘territory’ to the discussion would obviosuly struggle to recognise Denmark, Finland and Sweden on a map! I always fill in Bettertogether questionnaires and send them back! They have to pay!!!! Simples!! is to fail to read the question properly. you simply must read the question carefully. You can’t vote Labour, SNP or even Tory at the Referendum. “Should Scotland be an Independent country”. and proved yourself less clever than you think. If you’re AGAINST Scotland – vote NO. So it’s a case of with or against? Why can’t you be for both? Or can your mind not deal with such a concept? I must admit, I assumed that Sophie wasn’t a real person at all, just a way of getting leaflets under peoples’ radar. Sort of Blair MacDougall in a wig. However, if this information is true, she conforms in one regard. The only “young people” involved in the Better No campaign are politics students with an eye on their future career. Sophie is a real person and a fully paid up member (unless she gets free subscriptions as a student) to the Scottish Conservatives for whom she works tirelessly, when not off on jollies paid for by Edinburgh Uni, presumably as a precurseor to becoming a researcher at Wetminster and finding a safe seat. You can check her Tweets which pretty much confirm the above. Hence the guff straight out of the Project Fear guide to PR. I wonder why she does not state that she is a active Tory supporter in her letter. Is that not a bit disingenuous? Well Sophie,I will be closing the door behind me when we leave the British asylum. Unlike you,I am not terrified at the prospect of leaving the institute and even if it rains on day one and I get a little wet,I will do so in the knowledge that my future will be determined by my fellow Scots and not an unelected elite in London. I’m sure she will grow up, after all she is only 19. I am also sort of glad that we do have young Conservatives in Scotland and joining in the debate. I do though wish that she had written the letter herself and not as other have observed let someone join together a lot of well known Better Together phrases and then let her name go underneath it. Consistency of message is important in a political campaign which is fine in a short election though still wearing but in a campaign of this length it is somewhat painful. To hear the same phrases parroted by so many people makes one doubt the sincerity of the individuals and also wondering if they have really engaged with the debate. This applies to both sides as I equally switch off when I hear any variations on can, should, must or we don’t get the government we voted for etc. Sadly the standard phrases will no doubt become even more overused as we get to the later stages and soon will lose all meaning to many. Whatever happens I hope Sophie does not get it in the neck too much. I also received this letter and having read the first paragraph, thought here is a young woman who hasn’t thought very long or hard about this ill divided mess that is the United Kingdom! So I ripped it up! Wish I’d had the sense to do what you’ve just done and written back! I suppose my independence bias got in the way! That is my bias developed over time, my life experiences under this ‘union’ and my reading and observations. What a ‘silly wee lassie’ Sophie is! I hope my old Alma Mater can sort her out! Those who have vision and ambition for Scotland are voting Yes. Those with blinkered and blurred vision, who want to cling on to the status quo because there’s a bogey man round the independence corner, have their pencils poised over No but are wavering as they take a deep breath. For me, what I really associate the UK with nowadays is food banks. To repeat, FOOD BANKS. If this disgrace is not enough reason for voting for independence, then nothing is. I hope Sandor and Skea get wiser as they get older. I got to thinking about that passport bit and came up with this. I would prefer to travel on a Scottish passport rather than the British one I currently hold in this dangerous World we live in. For I’m sure that having a Scottish passport and not a British one could be the difference between life and death, were I unfortunate enough to be hijacked by terrorists, Scotland’s World reputation as OK people would probably have me invited up the front for a dram rather than a bullet. Yep – little things like releasing a dying ( took a bit longer than expected ) prisoner was well received everywhere other than Westminster and Washington. I am very real. I live near Inverness and have 2 grown up daughters. I am a Physiotherapist working for an MS charity. I live in a beautiful part of Scotland. I have 2 dogs(Izzy and Kerry) and a cat called Neo and I am very real indeed. I have lived in Scotland all my life apart from a brief spells in Wales and Spain. I am very well travelled and have visited well over a hundred countries in this world. Do you want any more info.to prove that I am real. My vision since I was 17 was to have an independent Scotland in which the people living there would be cared for and looked after when they needed it in their lives(because we will all need this at some time) and those that are fit and healthy would work hard and ensure that Scotland thrives. We can achieve this now and the starting point is voting YES in September. Then the hard work of transforming Scotland into a much fairer, happier country can begin. Those that will transform this country are you and I and all the people living here so I say lets start now and put plans in place so that the process can start as soon as possible. Those who see independence as the best way of achieving this goal are made up of all nationalities and creeds who live in Scotland and we are all coming together now and talking about how we go about transforming our country. That is a very healthy situation and I believe it will put us in very good stead for the exciting future that is before us. I am so upset. Why did Sophie not send me a letter too? Am I not important enough? Do I not have a right to hear her point of view? I am so upset that I feel the need to write to Sophie anyway. I won’t make my letter too long. I have a large packet of window envelopes in my cupboard. I could print a letter from my computer with her return address on, and then I wouldn’t have to write it on the envelope, just place it behind the window. Every time I think of something else to ask her or tell her I could print another letter with the address already on, and put it in another of my envelopes. I could write to her every day from now until 18th September. Or even several times a day. If I run out of envelopes I can easily go and buy another packet of 50 in Poundland. This would keep Royal Mail busy making profit for their newly acquired shareholders. many of whom might be supporters of Better Together. They could use their share dividend to donate to Better Together so that Better Together can pay the cost of the FREEPOST letters. Which in turn will keep Royal Mail busy and making profit so that the shareholders get their dividend. Does that sound like a useful business strategy? It is possible this was simply another form-generated letter, and this Sophie doesn’t exist as an actual person, which would more than a bit crap if it were the case. Despite many on here suggesting that this “Sophie” is a mystical fake conjured up by some party somewhere, I actually know this girl and she is a very lovely, thoughtful minded person. Everyone is entitled to their own opinion! One of the reasons I’m sure most of us live, and will continue to live, in this country (whether it is to become independent or not). Her views are based on what she believes is right for Scotland and she is merely expressing them in a rather courteous and relatively diplomatic manner. I personally am still undecided on what I believe is the right future for Scotland, but I do believe that she doesn’t deserve to be shot-down and belittled in such a way as Tracy has in her reply. Knowing Sophie, I would imagine she actually is “keen to know what you think” and that her intentions were entirely civil. My comment is not an opinion about the referendum, but simply to say that it’s generally not very decent to ridicule someone for stating their viewpoint on a political matter. Sophie is a real person, with real feelings and in all honesty I am rather “perturbed” that Tracy has replied in this way. It’s just not very nice, is it? Also, Sophie’s World is my favourite book, fabulous title choice T-dawg. Mills and Boon style propaganda, or a variation on the recent VNB “grassroots” ad campaign for the Union which cast professional models in a similar role albeit with some added wrinkles to emphasise their “ordinariness” – to wit, their particular brass band skills. As a result of herself putting herself firmly on the public record with her intervention into the referendum debate – without fully declaring her formal affiliations and track record – she necessarily makes herself subject to investigation, analysis, and robust comment in the “democratic” spirit of this “the greatest Union that ever was” and to which she seems to subscribe. I wish her no ill-will personally. On the contrary, I wish her a long and happy life. However, her personal attributes do not afford her any exceptionalist protection when she chooses to contribute to the body politic in this fashion. It’s interesting that Sophie failed to mention in the letter that she’s a Tory and that she’s also an officer of the Bitter Together campaign. Well played, I received the same 2 weeks back and also wrote back, posting the letter both online and to BT.